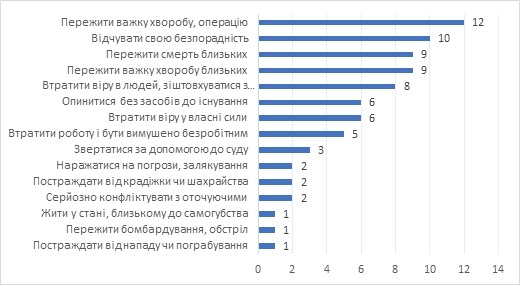 On November 30th - December 14th, 2018 Kyiv International Institute of Sociology (KIIS) conducted its` own public opinion poll. Data were collected from 2034 respondents aged 18 and above who are living in all regions of Ukraine except for the AR of Crimea with the method of personal interviewing. The sample was stochastic, and it is representative of the population of Ukraine aged 18 and above. In Luhansk and Donetsk oblasts survey was conducted only in the territories that are controlled by the Ukrainian government. The sample is representative of the population of Ukraine aged 18 and above. The subject of this press release is the changes in the stressful situations in the lives of the Ukrainians that happened over the past year. The share of respondents who have not experienced any stressful situation in 2018 is 38%, which is by 4% less than in 2017, and is approaching the corresponding index for 2016 (it was 37% then). 5% lost the job and faced the forced unemployment (versus 7% in 20176 the difference is insignificant). To some extent, the percentage of those who did not experience any stressful situations can be considered as an integral indicator that characterizes the overall level of stress in society (see Graph 2). 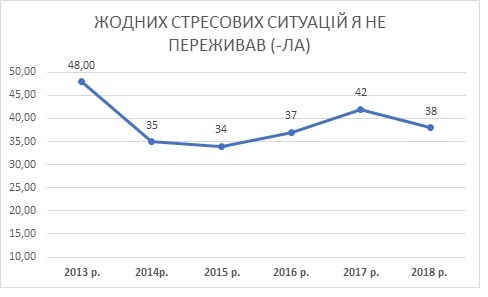 We see that the best situation was in 2013, before the conflict in East of Ukraine: 48% of the polled did not experience any stressful situations. In 2014 and 2015, the situation was the worst, since only 35% and 34% of the population did not suffer from the stress6 respectively (65-66% of the population experienced at least one type of stress). The situation improved in 2016 and 2017 when the number of non-stressed people increased to 42%, but in 2018 it fell again to the level of 2016. However, if we consider the aggregated classification of stress types (Addition 2, Table 2), then we will see that only a percentage of those who did not experience any stress decreased significantly compared to the pre-war situation in 2013, (perhaps due to those who chose the option “hard to say”). There is no significant difference in all other indicators from 2018 compared to those in 2013: the number of those who survived the illness or the death of the significant other increased by 2 percentage points, and the number of those who experienced other stressful situations decreased by 2 percentage points. However, these changes are insignificant, and all other differences are even smaller. If you compare 2018 to 2017, then it is appropriate to state that the situation either has not changed significantly or has improved somewhat. In particular, the number of those who lost their jobs and livelihoods decreased from 15% to 11%, while the "helplessness and despair, loss of faith in oneself" among the population decreased from 21% to 17%. In general, during 2018, women experienced more stressful situations: 48% of male respondents and 56% of female respondents experienced the stressful situation. The result is close to the figures for 2017 (48% and 57% respectively). Among those who felt helpless were almost twice as many women (13%) than men (7%). The proportion of women who experienced a serious illness and/or surgery (14%) is by 5 percentage points higher than the corresponding share of men (9%). It should also be noted that women more often than men lost faith in people and faced adultery (10% vs. 6%, respectively), and lost self-confidence (8% and 5%, respectively). Also, 10% of women and 7% of men experienced severe illness of significant others. At the same time, the proportion of men who lost their jobs and faced forced unemployment (8%) was slightly higher than the corresponding share of women (4%). People older than 70 years encountered with their own illnesses and surgery (30%, twice the proportion of the representatives of the age group of 60-69), with serious illnesses of close people (13%), with the death of close people (15%), and also felt own helplessness (19%) much more often than representatives of other age groups (see appendix). However, the proportion of respondents aged 18 to 29 who encountered meanness and lost faith in people (10%) is larger than the corresponding proportion of respondents older than 70 years (5%). Formulation of the questions from the questionnaire. Which of the following situations have you experienced in the past year? PASS THE CARD. MULTIPLE ANSWERS ALLOWED. *) since each person had the opportunity to select several stressful situations that he/she experienced during the year, then the sum of the percentages may exceed 100 (as it was in 2014-2016). So the sum of several points means not the percentage of people, but the percentage of "person-stress" (by analogy with person-hours – 2 man-stress means that either 2 people survived stress or one person survived two types of stress). For example, the percentage of people who have survived illness or death of close people is 30% of person-stresses, which can be less than 30% of people (see the first line) if some people survived both their illness and illness of a close one during the year.